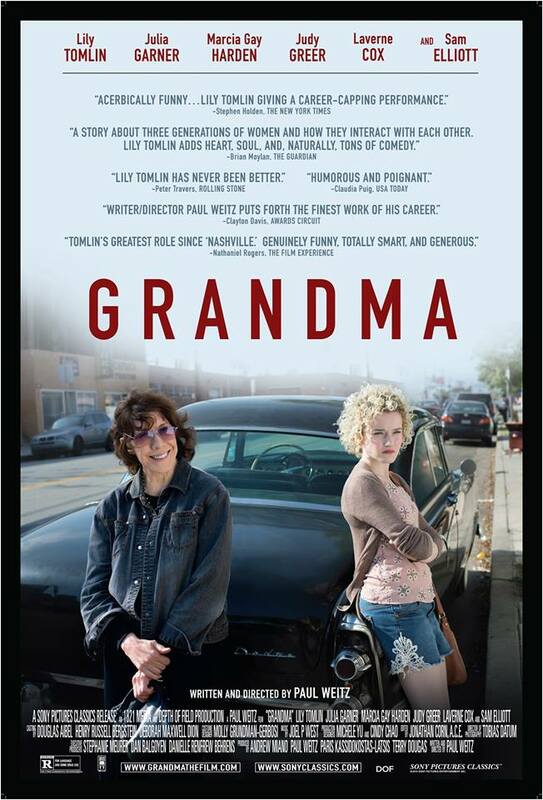 Yesterday evening Vanessa and I returned to The Flicks in Boise to see Paul Weitz’ “Grandma” starring Lily Tomlin and Julia Garner. The film tells the story of a young woman named Sage who must acquire $600 in one day to pay for an abortion. Sage seeks the assistance of her foul mouthed, lesbian grandmother as she feels she has no one else to turn to. The two go on an amusing adventure together and they each learn a lot more about each other than they probably wanted to. Sage witnesses her grandmother’s free, incredibly progressive spirit while also learning a lot about her troubled past. The film goes to some uncomfortably dark places among all the humor, yet none of it feels forced and these moments complicate Sage’s already difficult situation. I really enjoyed the visual style and use of color in the film, and I especially loved the performances of Tomlin and Garner. They have great on screen chemistry and it’s wonderful to watch. Without saying too much (you’ll have to see for yourself), I’d simply point out that “Grandma” adds more to the conversation of abortion that may pair well with the film “Juno.” In fact there’s a scene outside an abortion clinic that mirrors a scene from “Juno,” however Tomlin’s character’s reaction is quite different. I enjoyed “Grandma” quite a bit. The film is short, clocking 79 minutes, yet the story unfolds and wraps up just fine in that amount of time. I highly recommend “Grandma” to anyone up for a lighthearted film that tackles an incredibly difficult subject. The film performs wonderfully.